This will be truly amazing to see if you are visiting Cozumel during the end of May! Experience an ancient ritual from the fascinating Mayan culture. 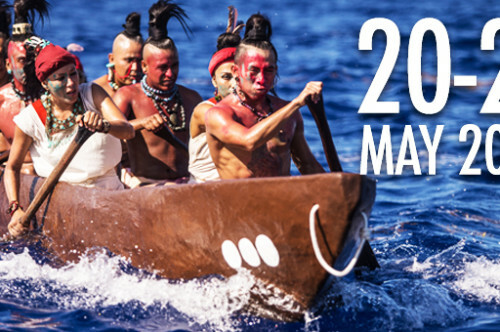 The Sacred Mayan Crossing will take place In Xcaret from 20th-21st May 2017. It is a recreation of the ancient Mayan ritual pilgrimage undertaken by the original inhabitants of Yucatán. Thirty canoes take part measuring 26-feet are hand made using an ancient Mayan model. Each canoe has a crew of four to six and are picked from 400 oarsmen from the communities of Xcaret, Cozumel and Playa del Carmen after intense training. The challenge for them is to row across the Channel of Cozumel from Polé, present-day Xcaret, to the island of Cuzamil (Cozumel) and to return later to Xaman Há, now known as Playa del Carmen. The Crossing is a total of 50 kilometers (30 miles) roundtrip, which is some 5 to 6 hours of rowing over the 420-meter deep Cozumel Channel. The south to north current running at 2 to 4 knots requires great physical strength and endurance to navigate which makes for a risky crossing for the oarsmen. Hence the intense training. First the canoes set out from Pole (Xcaret) to Cuzamil (Cozumel) and when they arrive they will worship the goddess Ixchel . Once in Cozumel offerings will be made to the goddess Ixchel who then sends a message to the inhabitants of the Mayan lands. The canoes will then return to the mainland, bringing with them the goddess’s omens of good fortune which will be revealed to all those who are in Playa del Carmen to hear them. This year, the celebration will begin on May 20th with a pilgrimage to Xcaret. During the course of the night guests will participate in rituals and supplications to the goddess Ixchel as they wait for the first rays of dawn when they will send the canoes off to Cozumel. Fertility of the earth Abundant fruit, bountiful harvests, good fishing and exuberant surroundings Good Weather A mild climate, favorable winds, enough rain, the right temperatures for growth Health Harmony of body, mind and spirit Continuity of Life Peace and harmony among species, according to the natural order of the planet. The Sacred Mayan Crossing renews for us the wealth of history and the cultural legacy of the Mayan past from the 11th to the 16th centuries. The courage and daring of these ancient navigators whose trade networks were one of the crowning glories of Mayan culture in Yucatán, comes alive once more. For the Maya, this journey was a mystical undertaking which profoundly influenced their intimate contact with the forces of nature. The event this year has been organised to revive ancient Mayan traditions such as their rituals, dances, music, dress and their relationship with the gods. Those who wish to witness the 2016 Sacred Mayan Crossing will learn about and participate in different re-creations of ancient Mayan cultural practices: trade, numerology, navigation and the re-telling of myths and legends documented in the sacred book, the Popol Vuh. This is sure to be an educational, enriching and mystical experience for all who attend.